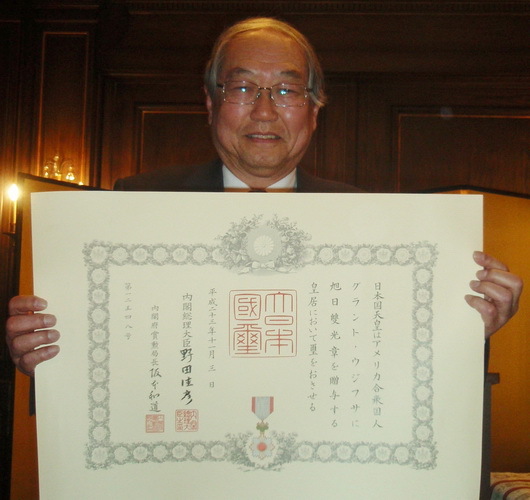 On January 26th, at the office of the Consulate General of Japan in New York, Grant Ujifusa, Redress Strategy Chair of the Japanese American Citizens League, was given the Order of the Rising Sun by the Japanese government for his role in securing a measure of redress for 110,000 Japanese Americans forced into internment camps during World War II. For the Japanese, the Order of the Rising Sun is the equivalent of a knighthood. In addition to devising a justification for the redress bill that would appeal to both liberals and conservatives in Congress during the 1980s, Grant is best known for reversing Ronald Reagan's public opposition to the bill, which the President signed on August 10, 1988. Grant's acceptance speech is presented below. I would like to thank Ambassador Hiroki and the Consulate staff for all the work they have done on my behalf. I would also like to thank all of you for coming today. Rudy Tokiwa from Sunnyvale, California, and a member of the 442nd Regimental Combat Team, the all Japanese American Army unit that won more Congressional Medals of Honor than any other in our history. Only Grayce is alive today. But let me say, as emphatically as I can, that without these six people, the effort to redress the grievances of 110,000 Japanese Americans forced into internment camps during World War II would have failed. For my six friends, redress was total e sho ken mei, which in Japanese means full throttle and non-stop. I'd now like to tell you the story of how President Ronald Reagan, for two years publicly opposed to the Japanese American redress bill, came to sign HR 442 on August 10, 1988. The hero of the story is Kazuo Masuda of Fountain Valley, California. This was a small town where Kaz grew up on a modest truck farm in then agricultural Orange County. On August 27, 1944, Kaz was killed in action on the banks of the Arno River in Italy while serving as a member of the 442. 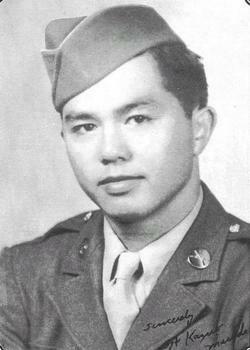 Sergeant Masuda was 24 years old, and was to be awarded the Distinguished Service Cross. Already in the Army when the war broke out, Kaz volunteered for service in the 442. From Camp Shelby in Mississippi, he would visit his mother and father and his sisters Mary and June, who were living not far away in the Jerome, Arkansas, internment camp. Kaz said to Mary that if anything happened to him, he wanted to be buried in his hometown cemetery back in Fountain Valley. After Mary learned that Kaz had been killed, she received permission to leave the internment camp for Fountain Valley, where she went to City Hall to make arrangements for her brother. But the town fathers there said to Mary: "We're sorry, but we don't bury Japs in our cemetery." Somehow word got to General Vinegar Joe Stilwell at the Pentagon. In the China-India theater, Stilwell was the commanding officer of Colonel Frank Merrill of Merrill's Marauders - a group of 2700 men, including 15 Japanese Americans of the Military Intelligence Service, who could read, write, understand, and speak Japanese. All of the men, all of them volunteers, fought and died and distinguished themselves behind Japanese lines in Burma. For a year, Merrill's Marauders tied down an entire Japanese division. The Marauders suffered an 85% casualty rate. Vinegar Joe respected, even loved, the Japanese American soldier. So he got himself to Orange County and confronted the town fathers. The General said, "This soldier is going to be buried here, and we're going to make an example of you SOBs and make a big deal of it. I am going to present Kaz Masuda's mother the Distinguished Service Cross at a ceremony at the Santa Ana Bowl." The town fathers said, "Oh, we're sorry." Invited to speak at the ceremony was a movie star, Army Captain Ronald Reagan. But there was a big problem: Kaz's mother refused to accept the medal. What she felt was this: "They push us off our farm and into a scary camp in the desert. Then they take my son, and he comes back in box. And they want to give me a medal? No thank you." "But General Vinegar Joe Stilwell is coming to present the medal to you," Mary said. "I don't care who he is," Mrs. Masuda said. "No thank you." Finally, it was arranged for Kaz's sister Mary to accept the medal. The blood that has soaked into the sand is all one color. America stands unique in the world, the only country not founded on race, but on a way - an ideal. Not in spite of, but because of our polyglot background, we have had all the strength in the world. That is the American way. Mr. and Mrs. Masuda, just as one member of the family of Americans, speaking to another member, I want to say for what your son Kazuo did - thank you." Many Japanese Americans knew that Captain Reagan spoke at Kaz's ceremony, but how could we get word into President Reagan to remind him of what he did in 1945 and perhaps nudge him toward changing his mind about our bill? I asked Bill Bennett to help; then Ed Rollins, Reagan's campaign manager; and then Richard Wirthlin, Reagan's pollster. None of them could do anything. After a meeting in the White House, Wirthlin called me and said that the top aides around Reagan were dead set against. Wirthlin suggested that we hold off for a session of Congress. I said we couldn't. We had been working for more than ten years, and we were running out of gas. At that time, the summer of 1987, I was book editor in New York, and one of my writers was New Jersey Governor Tom Kean, who is here with us tonight. I turned to him for help. Tom said that the President was coming to New Jersey to campaign for Republican state legislative candidates in October, 1987. The Governor said he would bring up redress with the President as they travelled around the state. Reagan said to Tom that he thought Japanese Americans were sent to camp for protective custody. Tom said, "No, no, it wasn't that." The next day, Tom called me and said, "Write me a letter speaking to that point and I'll get to it the President using a line of access for Republican governors." Thank you for taking the time to read my letter. Perhaps you recall a very special day for our family, December 9, 1945, when you came to a ceremony honoring my brother Kaz Masuda in Santa Ana, California. The presence of you and General Stilwell greatly affected the community, and led to a better life for our family. [For example,] many times I have been asked to speak at the Kazuo Masuda middle school. I speak to all the history classes, and quote your words to the students. If the legislation comes to you, I hope you will look upon it favorably. Reagan read June's letter, called Governor Kean, and said, " I remember that day at the ceremony for Kaz Masuda. I think redress is something I want to do." After the President signed our bill, June Masuda Goto was led up to the podium to meet him. The President leaned down toward her, and asked, "Are you Mary?" June answered, "No, Mary is dead. I'm her sister June." Long ago, a Buddhist priest served our family while I was growing up. He once said, "Where there is gratitude, there also is civilization." As we're here together now, I think we can be grateful to Kaz Masuda for his heroism on the battlefield, and grateful to Kaz's mother for her defiance of authority of the most imposing kind, and to Kaz's sister for her acceptance of life as it is, and grateful finally to General Stilwell for going the last mile to honor a fellow soldier. We are the beneficiaries of the civilization that these four Americans helped to create.